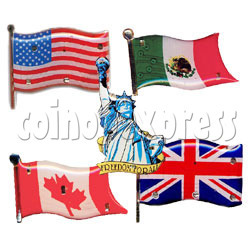 This is a series of country flag flashing pins or flashing magnetic. Flag styles included: USA, UK, Canada and other countries in the world. The liberty symbol "Satus of Liberty" is as well included. Custom design or personalised styles are available base on 3000pieces quantity. The flashing pins or flashing magnetic body are made by plastic panel with metal spares etched on back. The lights are supplied by two CR-927 long lasting batteries. Each pin contains 5 to 6 LED lights, colours included: red, green, or blue, and they are fixed in a pre-set circuit and each circle light travels quickly with brilliant and smooth color transition. The light flash brightly day and night and can inspire your patriotic spirit. 1pc CR-927 and 1pc CR-926 Lithium batteries supplied.